One of the things that baby boomers and Gen Y-ers like to critique millennials for is our lack of planning for retirement. They say we spend our money on frivolous things like avocado toast and pool floaties. Well, this new Millennial pink coffin pool float proves that even if it’s true that we spend money on pool floaties, we also plan for the future. Of course, we’re joking — a coffin pool float isn’t actually a real coffin. But apparently, this summer, some people might want to pretend they’re floating in one. 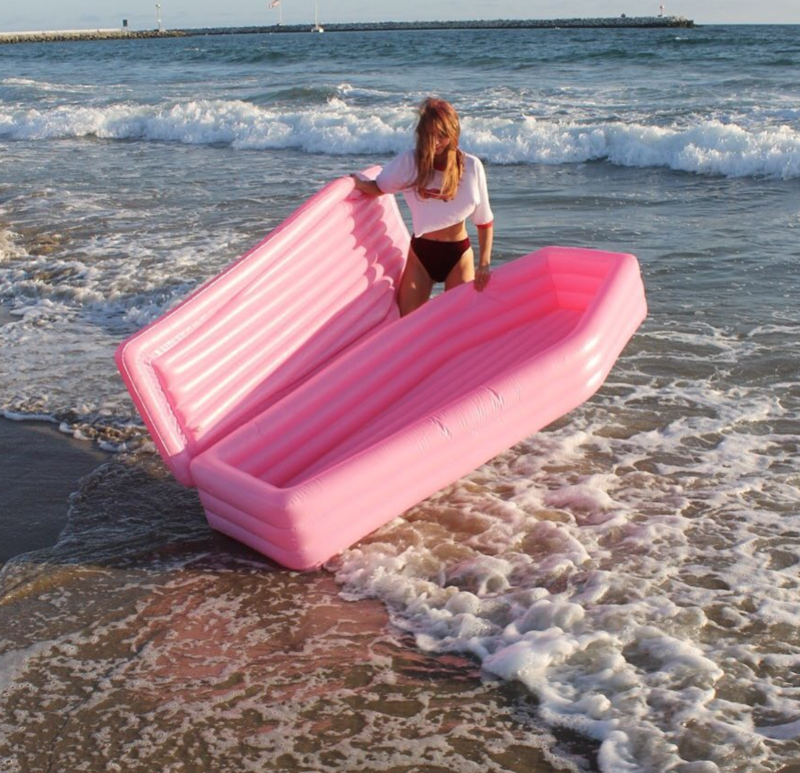 While a coffin pool float sounds morbid, its adorable pink color makes it oddly cute. In fact, it actually might fit right in with your pizza and unicorn pool floats. If you want to float around in a pink inflatable coffin you can soon, because you can sign up to pre-order one now from the site Pom Pom. According to Bustle, the float was created by Canadian designers Andrew Greenbaum and Ian Felton. The response has been so overwhelming that they’re considering launching a Kickstarter to bring their vision to life. Check out the coffin pool float that has everyone dying. As you can imagine, people have had some strong reactions about the death-themed pool float. It turns out that a lot of people are into the idea of pretending they’re dead while floating around in an enclosed floatie. Many even gave the pictures the meme treatment. We’re pretty sure Greenbaum and Felton won’t have any difficulty raising the money they need to bring the coffin pool float to, erm, life. Morbid Millennials, rejoice!